That struck Trimble’s considerable funny bone. It has inspired a comic riff on what people really did in Tombstone when they weren’t in a shootout and what visitors can do today. He uses facts and music and some tall tales as the moment strikes him during a performance. Trimble is Arizona’s first, and so far only, official state historian. Often called Arizona’s Will Rogers, he has performed around the state for decades. For the first time he is bringing his knowledge and humor to Maricopa. Trimble is the keynote speaker at “A Morning of History,” presented by the Maricopa Historical Society, on March 11. The event is 9 a.m.-noon at Maricopa City Hall. The morning will also include presentations by Elaine F. Peters, the director of the Ak-Chin Indian Community’s Him Dak EcoMuseum & Archives, and Chaz Jackson, president of the Buffalo Soldiers of American Arizona Chapter. Trimble, 77, taught history at the high school level and then at Scottsdale Community College for 47 years. Though he retired in 2014, he is still in his SCC office most days, usually prepping for his next gig. Retirement did not mean he stopped doing what he loved: Sharing Arizona’s history. Trimble calls the state “a land of anomalies and tamales.” The first white man in Arizona was a black man. And the Lost Dutchman was German, and he wasn’t lost. When it comes to the Maricopa area, he said he has always been fascinated by the Butterfield overland stage trail. But don’t expect him to deliver a detailed lecture on Maricopa’s history. “The only thing I’m leery of is going into somebody else’s neighborhood and trying to tell their story,” he said. He has a wagon-load of trivia to share involving Grand Falls, the movie Oklahoma and “zany gunfights” and a lot of real-life characters. Though born in Mesa, he grew up in Ash Fork, a small town and frequent target of his humor. Trimble is as anomalous as the state he calls home. His path to teaching history was as winding as a diamondback in a whirlpool. Though he enrolled in Phoenix College, he played semi-pro baseball. Then he dropped out to join the U.S. Marines. He taught himself to play guitar and entertained his military buddies with Elvis Presley and Johnny Cash songs. He went back to school, earning his bachelor’s degree from Arizona State University in 1961. He coached some high school baseball. He took up with a local folk music group called the Gin Mill Three, traveling the country to keep entertaining. He did some cowboying in Montana, where he picked up on a lot of details of western history he had never heard before. When he returned to Arizona and started teaching at Coronado High School, he wanted to bring the history of the West to life. That was no easy task in high school, especially during the Vietnam War. To show them how folk music can tell a country’s history, he brought in his guitar and sang some Johnny Cash and Bob Dylan songs. “So I had the hippies and I had the cowboys,” he said. In 1972, Trimble created a course on western history for Scottsdale Community College, and 300 students signed up. “I never taught anything else again,” he said. 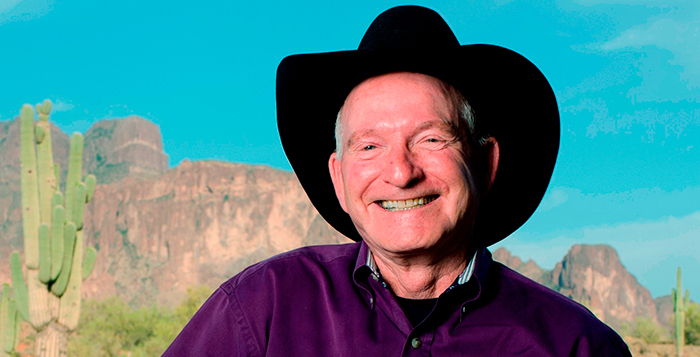 He wrote his first book, “Arizona: A Panoramic History of a Frontier State,” in 1977. During book-signing tours, he played his guitar and sang. That developed into an act. He has written 15 more books, and the act keeps going as long as people like their Arizona history delivered with a humorous twist. Gov. Fife Symington appointed him official state historian in 1997.